Many condominiums in Fort Lauderdale claim to be luxury residences, but few can truly own the title of luxury resort, and L’Ambiance is one of them. Situated at 4240 Galt Ocean Drive, L’Ambiance provides you with a beachfront experience unlike any other in Fort Lauderdale. This 26-story boutique structure is home to only 124 luxury residences, giving you the space and serenity you deserve as well as access to vibrant Downtown Fort Lauderdale. Units are now available in three-bedroom, two-bathroom floor plans and range in size from 1,836 square feet to 2,318 square feet. Luxury units start at $925k and go up to $1.25M for larger three-bedroom models. At L’Ambiance you can truly enjoy the best South Florida has to offer with expansive views of the crystal blue Atlantic Ocean as well as the canals of the Intercostal Waterway. Of all of the luxury resorts on the beach in Fort Lauderdale, L’Ambiance is the newest and most modern. Every unit at L’Ambiance has at least nine-foot ceiling heights, giving you plenty of head room. In the kitchen, European-style cabinetry, designed custom for L’Ambiance, accents the granite countertops and imported marble floors. State-of-the-art KitchenAid appliances make up your cooking and food storage suite. Floor-to-ceiling glass lines every unit along with sliding glass doors that lead out to the terrace. Some units even have a wraparound sunrise and sunset terrace, so that you can enjoy the beautiful South Florida views 24-hours a day. Private or semi-private elevators lead into each property. Trademarks of L’Ambiance include spacious master suites, walk-in closets, roomy Jacuzzis, and marble everywhere! Even better than the elegant design at L’Ambiance are the countless amenities afforded to each and every member of the community. Find out what it means to live in true luxury resort style, with 24-hour security and concierge, secured private parking, and valet parking available on-demand. The fitness center at L’Ambiance is professional grade with each and every piece of equipment fitted with a flat screen TV and his and hers locker rooms outfitted with saunas and steam baths. Entertaining guests? You can all hang out in L’Ambiance’s party room with formal seating and a bar area complete for any formal or informal affair. Watch the game in the Sports Lounge with wide screen TVs and billiards. The Card Room and The Wine Room also offer social atmospheres more conducive to relaxing or studying. The best part about beachside resort living at L’Ambiance is the 200 feet of private waterfront beache complete with private, full-service cabanas. Relax on the oceanfront pool deck or take a dip in the tropically landscaped heated pool area. 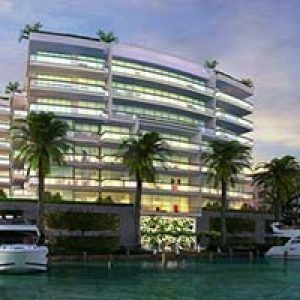 L’Ambiance is truly the gold standard for luxury waterfront condominiums in Fort Lauderdale. Even some of the newer developments cannot offer up the modern style, spacious floor plans, or countless amenities available at L’Ambiance. The location puts you right in the middle of vibrant Fort Lauderdale and just a short distance from countless dining, shopping, nightlife, and entertainment options. Don’t miss out on this opportunity to own a timeless piece of Fort Lauderdale beachfront luxury!